"I am professional artist from Baltimore, Maryland and I have exhibited work at the Museum of Contemporary Art (Geffen Contemporary), Los Angeles; Kunsthalle Wien, Austria; Kwangju Biennial, South Korea; Atlanta, and the Center for Contemporary Art (Nexus) Biennial, Georgia. I was the recipient of a Pollock-Krasner Foundation Grant, and was former Assistant Director for the Santa Fe Art Institute(NM). In addition to the Pollock-Krasner Grant, I have been awarded an Adolph and Esther Gottlieb Grant, Change, Inc. Grant, and an Artists Fellowship, Inc. Grant. I received artist fellowships at The MacDowell Colony, Bemis Center for Contemporary Arts, Santa Fe Art Institute, DUCTAC Art Center(Dubai), and at the Caldera Artist Residency Program. My artwork is included in collections nationally and internationally and I was a West Prize winner in 2012. I was the Residency Director of the Bemis Center for Contemporary Arts from 1998-2002 and was the Director of the MFA Program at the University of the Arts, Philadelphia from 2009-2012. I am currently the Director of Graduate Studies in the School of Art at the University of Cincinnati in the College of Design, Architecture, Art, and Planning." "It all began in a Stone Carving studio outside of Florence, Italy, if you can believe that. I was a young apprentice stone carver and after my first couple of days in the studio hammering away at the marble block, the stone carvers kept telling me in Italian, “you’re not hammering a nail into a piece of wood…this is “marmo” and “molto duro” …”very hard…stop using your wrists to hammer and use your shoulder to move the heavy mallet up and done. I had a roll of duct tape in my sculpture tool bag I had brought from America and I wrapped my wrists with the silver duct tape to remind myself to “use my shoulder and not the wrists” when carving. I called my father in Baltimore and asked him to send me cases of silver duct tape, as it was the perfect solution to my problem. I never forgot to hammer the correct way with the “duct tape gloves” on my hands. Every three months the apprentice stone carvers were given a three to four week break from carving to recuperate from the laborious work. But as a young artist, I still wanted to make things. I started to make “drawings” from my duct tape stash. I created drawings and sculptures with tape referencing things like the “Gates of Paradise” bronze doors by Lorenzo Ghiberti from the Baptistery in Florence and Donatello’s bronze statue of David. 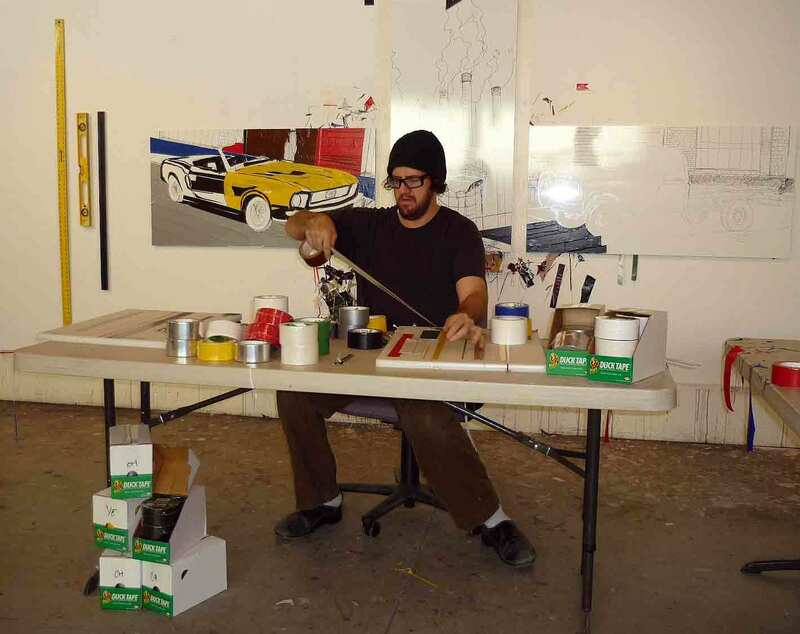 It was the beginning for me to incorporate numerous materials into my work including duct tape." "For me the versatility of duct tape is my favorite attribute. The history of the material is also important. My mentor, artist Mel Chin, said to me long ago. “If Michelangelo was alive right now with all these tools and innovations at his disposal… do you really think he would be carving Carrara marble?” The material is tactile and tangible, dimensional and difficult, transformable and immediate. I crave the ability to create and make mistakes along the way in my work. It is something I could not do with stone carving (which is still my first love). Mistakes were seen in the marble and you would have to start all over. Duct tape was created to be a solution to a problem and intrinsically, as a contemporary conceptual artist experimentation is a door to great achievements as well as failures. Achieving a balance of multi-disciplinary studio work with a material as forgiving and forgetful as duct tape is part of the reason I enjoy using it in my work. It has become a “truly American oil paint” for me and to create three-dimensional relief drawings with this material is something that I can always strive to be better at accomplishing." Q: How did you get involved with The University of Cincinnati? "The University of Cincinnati is an amazing forward thinking institution of higher learning where experimentation and research are the keys to developing new pathways for the future. Can duct tape be the glue for this vision? I don’t know…but why not. I have developed a course that is allowing my students to focus on relating idea to form in the context of a material that has an incredible history of transformation. The course is sponsored by the ShurTech Brands LLC, Duck Tape headquarters and the students are creating large scale sculptures to be covered with duct tape referencing the theme of this year’s Duct Tape Festival outside of Cleveland. The theme this year is “Under Construction.” In a way, my work as well as the work of student artists is always “under construction” as we navigate what it means to translate idea to form. That gave them their start to research ideas they were interested in pursuing and huge latitude of history it has been. Their proposals were submitted to the company for final approval and we are building away in preparation for the festival in June. We also plan to showcase the work in May at the University of Cincinnati prior to transporting the sculptures north to the festival." "I often look at historical buildings and I am inspired by the aging of the material used to construct these marvels of architecture and engineering. I am also fond of visiting different cities around the globe and connecting with problem solving individuals who reside in those cities. I also have a long history of taking apart things from the washing machine to an electric toothbrush to investigate how they have been engineered and created. This leads to potential new ideas and motivations to make work." "My process of translating an idea to form is a time-consuming act of researching, analyzing, and evaluating to combine intuition and directed response to certain visual stimuli. I very much am intrigued by the notion of happenstance in influencing the way in which I work. For example, I will notice multiple layers of paint peeling from an old stairwell and be inspired to rese arch the history of a particular building and who occupied the building through its history that led to the decades of wear and tear on the stairwell in the building. This may lead to the creation of an artwork referencing the site." "What I love most about being an artist and mentor is the collective story in which all of us on this planet collaborate to create a new “scene” in the play. My role as a mentor has shaped much of my direction in terms of the process of learning together through shared knowledge." Q: Do you have a favorite piece you’ve created? "My favorite piece to date is a large-scale sculpture I created entitled “Keystone.” This artwork was created during an artist residency at the Bemis Center for Contemporary Arts in Omaha, NE and is in the permanent collection of Karen and Robert Duncan. The work is a depiction of the right hand of Michelangelo’s David created with Styrofoam covered in duct tape. The hand is suspended from the keystone area of an archway constructed of milkcrates. In the hand is the fallen keystone of the arch. From the original sculpture, I cast the hand into aluminum and reinforced the archway with a steel interior. The keystone I carved from Carrara marble." "For me, the ultimate act of making an artwork relies on past experience and the ability to use skills and knowledge to be creative. Imagination is a constant evolution of processing communication and visual stimuli. It also allows for the subconscious to direct movements and decisions." "For me, creative blocks are mainly a matter of time management. As a professor and a mentor at the university level, demands on scheduling and meeting take up an incredible amount of time. I use the time between meetings to note ideas of future projects. This ongoing “notebook” of ideas to create in the future has grown to hundreds of pages. I often go back through the pages to reconfigure and combine ideas for future work. The collection of ideas form a “roadmap” to begin a new series of work always allowing for multiple exits towards new directions." "As an individual who believes that creativity and the ability to problem solve are valuable (and essential) qualities for the global human condition, I am optimistic that I play an inspirational role for a generation of new artists who are fearless in their determination to continue the process of translating idea to form." Q: What inspired you to create your artwork? "The most recent series of works are drawings from places I have been. As a photograph creates a memory, these works are meant to elicit thoughts of a disappearing age. As the monuments are threatened with any host of environmental and societal problems, solutions are being sought to save these icons. To create them from this material that is meant to be a patch for a problem, I believe it works well conceptually. I am part Italian in heritage and the passion to create is what I truly care about. This has an equal correlation in trying to recapture many memories of my life through the work. To stand in front of the Taj Mahal is mind blowing. Your eyes can’t believe what they are witnessing. I try to relate that feeling with a lot of my work. An immediate reaction of disbelief that this material has been used to create these drawings. I also am drawn to the humorous qualities in the work and in life in general. I don’t believe in the Capital A in art. I believe that creativity is part of our existence and should be celebrated daily. Patience and perpetual motion are always guiding the movement through time. I would like to create an atmosphere of memory and presence and when the works are just finished, for about a week, the smell of duct tape envelops you. Everyone who works with the material knows the smell. A memory of what was fixed, covered, bound, connected or created. It is a material that for me has become as essential in my life as marble. It is part of me to produce these works. I never stop dreaming of what could be next and live in the moment. A goal of mine has always been to achieve a balance of what the Italians call Sprezzatura or ‘effortless mastery’ and reckless abandon in my work. The best critics of work I believe are the people who live with the work daily. Every museum guard or janitor that has told me they love my work brings into focus the way that contemporary creation does not always have to have an “art-stamp of approval.” Failure is intrinsic to the material I use and to life. So is humor. The pendulum of tragedy and comedy continues for me as I fall effortlessly in love again and again with the ability, as Mel Chin said to me, to not make what is expected of me but to always follow my heart."